Welcome to New Smyrna Beach. Casual beautiful home. Feel at home while living in absolute comfort with your own privately heated pool and built in hot tub. The home is 3200 square feet inside and 3100 outside with a screened-in solar heated pool, plus propane heat, or electric heat/Hot tub, 3100 Sq. Ft. 24 Ft. high ceiling covered porch section. One floor level, easy access for wheelchairs. Cathedral Ceilings 18 Ft. glass from floor to ceilings compliments the back view of the house with beautiful views of wildlife, sunrises, & sunsets. Every bedroom a TV & DVD player. Bright and airy open floor plan. Formal Living and Dining Room. 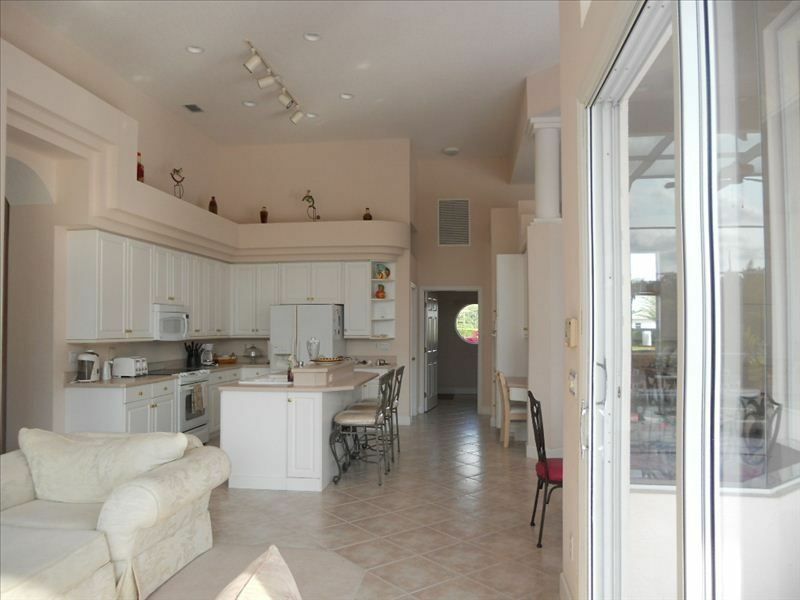 Family room with fireplace, eat in kitchen with center island, and two stoves.Back of Home & Breakfast nook with open view to pool surrounded with tropical palm trees.Three rooms have direct access to pool. Outside screen keeps bugs out but lets you get the sun if you like to tan. The covered porch is always in the shade with fans for a cool breeze. Childproof Fence: For kids or pets, a see through mesh fence that protects any access to the pool without an adult to open it. Plus alarm system chime to hear doors opening in-case little ones are exploring..
Four bedrooms, master has a King bed, a lounge couch, full bath within the room. On the same side of the hallway the 2nd bedroom has another king bed & full bath 4 ft. away outside in the hallway. The Twin bedroom is the 3rd bedroom and has 2 twin beds, and a full bathroom within the room. The 4th. bedroom with a Queen bed also we have a new couch that sleeps two, and closes off for privacy. The extra Queen pullout couch in front of the fireplace with open view to the sky. You can sleep under the stars can sleep 2, also 2 double blow up beds for 2 couches fits onto couch's so couch is your backboard. Sleeps 8 in beds , 2 on queen pullout couch sleeper & extra blow up beds and cot beds for 6 more if needed. Pool/Hot tub has LED lighting for beautiful relaxing colors at night. Outside pool bathroom, shower. Inside three full baths, master has also a Roman shower with easy access for the handicapped.Ramp available,and other equipment for the handicapped. Excellent security and Medical Alarm system, pool and garden service. This area has the charm of the fifties. You are hidden but only minutes away from the real world. The closest Airports are Daytona 20 minutes,Sanford Orlando 35 minutes, Orlando International 45 minutes, Disney World 40 minutes, and Cape Canaveral 25 minutes.Excellent golf courses near by. The National Seashore of New Smyrna has beautiful white sandy beaches without the crowd of Daytona and the cement high-rises. The small, quaint, eat-in-the-rough seafood restaurants directly on the water share the beauty of wildlife here. Manatees,Dolphins, Bald eagles, Cranes. and more. has a beautiful covered porch poured concrete not aluminum . Heated with electric heat. The heater has a auto defrost and will heat in any weather where most heaters will shut down . Cold weather 40's pool at 91' $175 per week compare propane can run 400-600! (2) One inside master bath one outside in the pool area. Beautiful home away from the crowds! Really enjoyed this beautiful home! It’s nice and spread out and the screened in pool area is huge! About an hour twenty minute drive to Disney area though. Home is located on sandy road, which made it a bit tricky for motorcycles but garage space and parking for truck and trailer was plentiful. Cindy was super nice and informative. Great motorcycle riding in the area and we even saw the manatees up close! Great property. 10 minutes from the beach! Great property with the pool being the highlight! Not on the beach but only a 10 minute drive to reach one. Close to grocery store and easy access to interstate. Would recommend. Only good things to say about this house and the hosts. We would definitely stay again. After talking to you , you said you were not sure why you wrote that. Your girlfriend is the one that booked with us and read all the place offers. The house is advertised for the correct size no hidden secrets. You only stayed for 3 days to get back to work and get around the hurricane that hit Caroline. I let your other party members stay an extra night for free to make sure they were safe and had a place. They told me they loved it. I am sure driving down and to turn right around and go back was no fun and frustrating. It would have been nice if you had left an honest review. Being mad at your girlfriend for booking in Florida had nothing to do with the property. Happy wife happy life! The home is beautiful and we hope to return. It was accommodating of our pups too! We came for the beach but only went one day because we enjoyed spending time at the house so much in the pool and hot tub. We grilled out and ate all our meals in on the lanai. It was a great family vacation! Beautiful home with very comfortable furnishings. Very clean. We were somewhat disappointed in the location after having been used to staying closer to the beach. It took us close to 15 minutes to get to downtown Flagler Avenue from this location. In spite of the location Cindy was very accommodating. There are plenty of towels, dishes, pots and pans, everything you need and more. It's important to note that whoever chooses to sleep in the queen bed which is part of the tv room will not have any privacy. Cindy was very helpful when we were trying to adjust the evening ac temperature. If you are looking for a large home for a family reunion or to host an event, this is the perfect place. Very impressive and comfortable vacation home! Thanks for the review. The beach traffic on weekends does slow things down but there was a parallel road you could have taken to shorten your time to get to Flagler Avenue. The straighter route would have had you at the beach in under 7 minutes at the 3rd Avenue beach ramp. Flagler Avenue is always busy then. I had shown someone in your party on the map but I guess you were all excited about your stay.and forgot. The queen bedroom isn't a tv room it's a bedroom with a large TV and couch that can be private if you let your other party members know you don't want to share the larger TV. Every bedroom has their own TV . We have lots of couples that enjoy the home and don't host larger events because of the parking and our neighbors. had a fun time. I hope when I am older I can enjoy my girlfriends like that to. Thanks Catherine. Rates are subject to change- Cancellation policy, choose other dates. Please look at calendar to see what's open. Holidays and special events may be an up charge. Pool heat is an extra cost at 15 cents per kw H Propane used to heat the hot tub, grill and fireplace is currently 40. per 5% usage you pay actual fuel cost at the time of rental. A meter is read upon check in and out. The cost is taken out of your security deposit. Depending on time of year, desired pool temp and outside temps we cannot give an exact dollar amount for pool heat. Once the season is upon us we can check a 24 hr period and give you cost. You can also monitor while in the house.